EDMONTON — The Arizona Coyotes' confidence didn't waver after allowing a late goal. 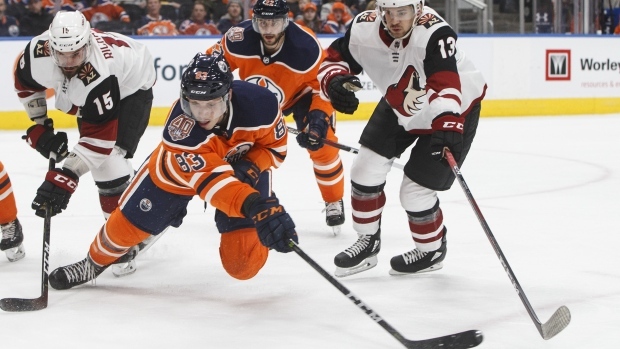 Vinnie Hinostroza scored the shootout winner, adding to a goal in regulation, as the Coyotes came away with a 3-2 victory on Tuesday over an Edmonton Oilers team missing star forward Connor McDavid with the flu. Josh Archibald also scored for the Coyotes (27-28-5), who have won four of their last six games and have moved to just one point back of the Minnesota Wild for the final wild-card spot in the West. Arizona goalie Darcy Kuemper made 35 saves, including seven in overtime. Adam Larsson and Ryan Nugent-Hopkins responded for the Oilers (24-29-6), who have lost five straight. Edmonton has only one win in its last 12 games overall, and just two wins in its last 14 games at home. "We found a way to salvage a point and we continue to push forward," said Oilers forward Sam Gagner, who played his first home game with his original team after being re-acquired in a recent trade with Vancouver. "Down the stretch here we are going to have games where maybe we don't deserve to win and we do. We just have to keep fighting for points because you never know what happens at the end of the day." There was no scoring in the first period, with nine shots on Oilers starter Mikko Koskinen and eight on Kuemper. Arizona broke the deadlock seven minutes into the second period when the Oilers failed to clear the zone, leading to a big rebound and a wide-open net for Archibald to deposit his eighth goal of the season into. The shots through 40 minutes favoured the Coyotes 25-15. Edmonton finally got on the board 3:27 into the third period on a point shot through traffic by Larsson, his third of the season. Leon Draisaitl picked up an assist for his 70th point of the season. The Oilers had consistent pressure late in the game and were able to tie the contest up again. With their goalie pulled, Nugent-Hopkins battled at the side of the net to slip in his 19th of the season with just 11 seconds remaining. Edmonton outshot Arizona 7-2 in overtime, but couldn't prevent the shootout. Both teams are back in action on Thursday night as the Coyotes are in Vancouver to play the Canucks and the Oilers host the New York Islanders. Notes: It was the third of four meetings between the two teams this season. Both teams came into the game with wins in the other team's building. The Oilers and Coyotes are tied for the worst record at home this season with a .446 win percentage. … Defenceman Andrej Sekera made his season debut for the Oilers after rupturing his Achilles tendon during an off-season workout.